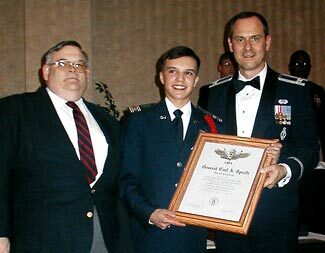 C/Col Andrew D. Shepherd of the Ohio Wing receives General Carl A. Spaatz Award number 1482, dated 23 December 2002, at the 2003 CAP Ohio Wing Conference awards banquet on 15 February 2003 in Columbus OH. Making the presentation is TSA President Col Richard L. Anderson, USAF, chief of the Air Force Auxiliary Division in the HQ USAF Homeland Security Directorate, and former CAP National Commander. Also joining in the presentation was CAP Col William S. Charles, then commander of the CAP Great Lakes Region and now CAP National Inspector General.